We're delighted you're thinking about studying at NTU. We know this is your biggest adventure yet, so we’re here to show you the way. Here’s your step-by-step guide on how to apply. We welcome a whole range of qualifications from people of all ages and countries and will consider your application on its individual merit. It’s not just exam results we’re interested in, we want to know about your skills and experiences too. Your personal statement and references are really important. On some vocational courses, work experience that you have already gained is also vital. You should include all of your qualifications and grades, including resits or predicted grades for pending qualifications. Be honest, thorough and persuasive in your application and personal statement. Remember, we can only make a decision based on the information you give us. Check the latest entry criteria for the course you’re interested in, then follow the steps below to apply for a full-time undergraduate course at NTU through UCAS. 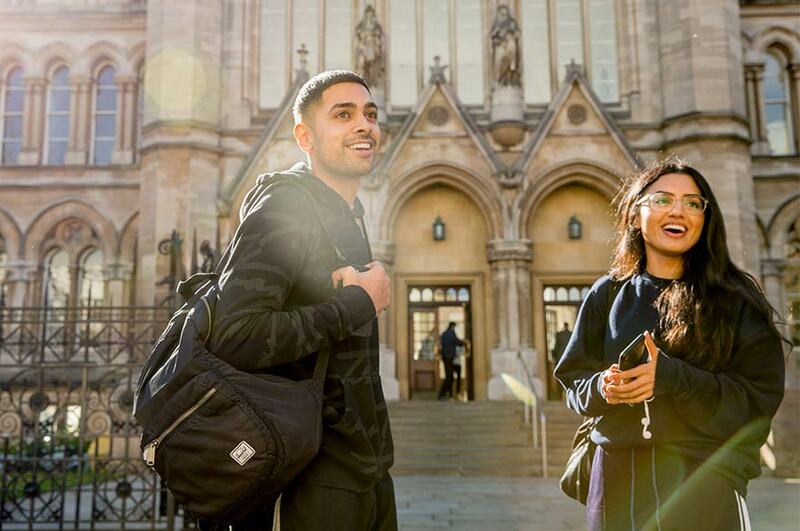 To be guaranteed equal consideration, you need to submit your application by the UCAS deadline of 15 January 2020. The University welcomes applications after this date, although offers will be subject to the availability of places. Our UCAS institution code is N91. When you complete your registration, UCAS will generate your username. Make a note of your it as it will not be displayed at a later stage. You will need your username and password to log back in and access your application, so keep them safe. The UCAS application form is quite detailed, but you don’t have to fill it out all in one go. You can save your application and come back to it another time. Add @ntu.ac.uk and @ucas.com to your email Safe Senders list and check your emails regularly as we’ll be sending you important information throughout the application process via email and text message. Make sure all your details are up to date on UCAS so that everything reaches you. Use UCAS Track to check the status of your application throughout the process. We normally process applications in around 14 working days. This can vary in cases where we need to consider academic consultation, an interview outcome or special circumstances. If you are invited to an interview, you’ll find our information on post-application interviews helpful. If you’re applying for one of our practice-based Art and Design courses, you will also need to think about building your creative portfolio – a key part of your application. Unconditional Offer – an offer where you have already satisfied the entry criteria and can have a place on the course. Nottingham Trent University also makes unconditional offers to selected students who have high predicted grades and can demonstrate both their passion for their chosen course and a broad range of interests and skills in their personal statement. Conditional Offer – an offer whereby you must fulfil certain criteria (e.g. grades) before you can be accepted on the course. Alternative Offer – you don’t meet the entry requirements for your chosen course so we have made you an offer for an alternative course. When you’ve received decisions for all of your applications, you’ll see an alert displayed on your UCAS Track page, advising you to reply to your offers. Unconditional – If you accept this as your firm (first) choice then your place is confirmed. Conditional – You are able to choose one course as your firm choice and one as your insurance (second) choice. Make sure the offer you accept as insurance has lower offer conditions than your firm. This way, if you don’t get the grades you were expecting for your firm choice, you are likely to meet the conditions of your insurance choice. You’ll need to decline any other offers you’ve received. Step 6: Did you make the grade? A-level results will be published on Thursday 15 August 2019. You can check if you’ve been accepted on UCAS Track. If you don’t meet the requirements for either your firm or insurance choice, you may still be eligible for your course or be made an alternative offer. If that’s not the case, you will be eligible to enter Clearing. If you have any questions about applying to NTU, our Admissions team can help. Call us on +44 (0)115 848 4200 or email applications@ntu.ac.uk with your query. If you’d like to apply for a part-time undergraduate course, you’ll need to apply directly to the University via the relevant course page. In accepting the offer of a place at the University you are also accepting the Terms and Conditions and agreeing to comply with the University’s Regulations, Rules, Codes, Policies and Procedures (the Regulations) that apply to enrolled students. If you accept the University’s offer of a place on a course we strongly recommend that you download and save these documents for future reference, as they form your contract with the University.